No, the title does not indicate that this is a local horror story; it’s just clickbait, but literally true, and I couldn’t resist. On November 21 of this year the Cape Gazette ran a story about a Milton homeowner who received approval from the town’s Historic Preservation Commission to raise his house 32 inches and to make other structural and aesthetic improvements. The house in question is at 131 Union Street, in the historic district – and also in the town’s flood plain, no more than 100 feet from the Broadkill River. What interested me more, however, was the year the house was built and the original owner. 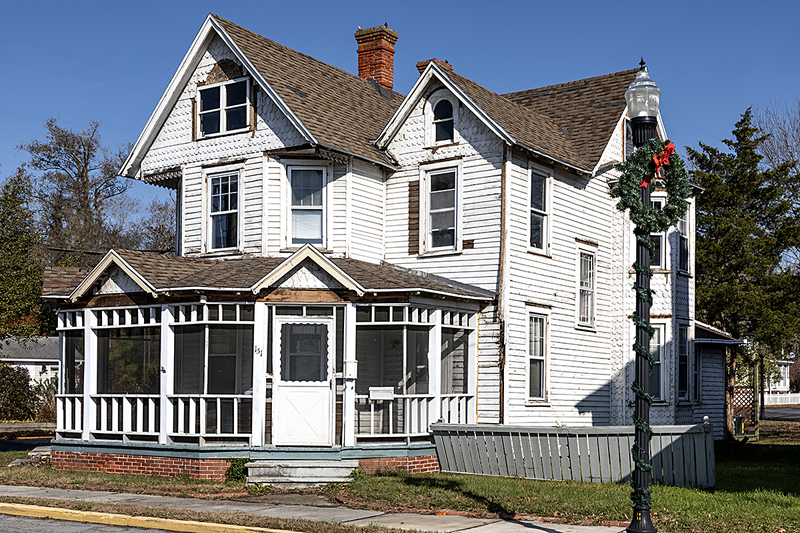 The 1982 nomination document that supported the creation of the historic district called 131 Union Street the “Walls house” and listed the year it was built as 1905. Two documents – the 1910 U. S. Census and the Milton letter of December 6, 1907 in the Milford Chronicle – identify the original owner as Joseph Hopkins Walls (1873 – 1957), who for most of his working years was a butcher. It turns out that Joseph Walls appeared with atypical frequency in the local and statewide newspapers. The son of farmer Nehemiah Walls, a farmer, Joseph finished the eighth grade and left school. Barely eighteen years old when his father died, Walls began working as a sailor, and that was the occupation he gave the enumerator in the U. S. Census of 1900. However, his life changed permanently in October 1895. At that time, he was a deckhand aboard a dredger operated by the American Dredging Company, when a sudden lurch of the vessel threw him into machinery that tore off a finger and mangled several other digits. In 1896, Walls sued his former employer for damages due to personal injury, claiming that negligence on the part of the company created the conditions which led to his injuries. The jury at the first trial found for Walls, the plaintiff, in the amount of $4000, but the company won on appeal and the verdict of the lower court was reversed. The appellate court of the 3rd Circuit reasoned that Walls knew the risks, having worked in the same area of the vessel for several weeks and under the same conditions, but did not complain about safety lapses to his employer prior to the accident. To rub more salt into the wound, Walls was required to pay court costs to the American Dredging Company. With these injuries, it is doubtful that Walls continued to work in the maritime business, and he settled on running a butcher shop. We know that he must have started before 1900, as he sold the business in 1932 after being a butcher for 36 years. His shop, which sold other merchandise in addition to meat, was located on Union Street just south of the bridge over the Broadkill, in a building that no longer exists. The meat trade must have been successful, for in 1903 he acquired a wife, Lucinda Stephens, and in 1905 he had a house built at the present-day address of 131 Union Street, just a few steps north of his shop. One would hope that after the crippling mishap of 1895 and the ensuing legal battle, his life would be more settled. October 21, 1904, Milford Chronicle: Joseph Walls badly burned four of his (remaining) fingers in a kitchen accident. June 9, 1909, Wilmington Morning News: Joseph Walls was kicked by a calf and had several teeth loosened as he was loading it onto a car at the Milton railroad station. Nationwide newspapers, August 13, 1909: The August 12 fire, which narrowly missed his house thanks to it being on the other side of the Broadkill River, burned down his butcher shop. He bounced back fairly soon after that disaster, moving his business almost immediately to the corner of Federal and Mulberry Streets until he rebuilt on Union. He was only minimally insured, however, with losses estimated at $800; only a handful of business owners in the burnt-out area were insured at all. June 7, 1913, Wilmington Morning News: A man named Joseph Walls was kicked unconscious in Milford by a calf he was herding into a car. This sounds like it could be Milton’s butcher. 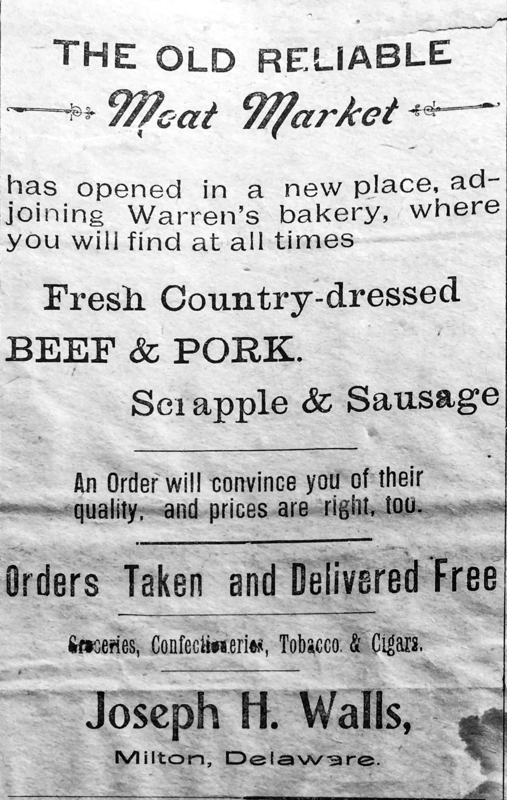 November 9, 1920, Wilmington Morning News: Joseph Walls was attacked by a bull while butchering a just-purchased heifer on a farm near Waples Mill. He escaped injury to himself and his horse by dodging from tree to tree until the farmer who owned the animal managed to drive it back to its pen. The newspaper also reported that an African-American boy who worked for Walls and was with him at the time had to be induced to climb down the tree to which he had fled when the bull charged. February 14, 1925, Wilmington Evening Journal: Walls was kicked by a mule and severely injured, on the Clendaniel farm at Slaughter Neck. October 29, 1928, Wilmington Morning News: Walls was gashed on his left heel when he stepped on a sharp knife at a hog-killing. He required stitches, and crutches to get around afterwards. January 25, 1929, Wilmington Morning News: The Walls store was burglarized, the thieves taking a quantity of cigars, cigarettes and $15 in cash. February 11, 1929, Wilmington Evening Journal: Joseph Walls was driving his delivery truck on north Union Street when it was struck by a coal truck backing out of a driveway. He received a sprained knee and his truck was badly damaged. While every butcher runs the risk of injury because of the use of sharp knives and proximity to large animals, Joseph H. Walls seems to have had more than his share of accidents. Despite all that, Joseph H. Walls lived to the age of 83, enjoying financial success in his butcher business and real estate investments. This all happened before my time but my mother was born and probably bought meat from him. At times like this I would love my mom to be here to talk about this. Thank you for enlightening us.